At a bar with no foosball, pool table, Jenga or beer pong? Forgot your portable dice or deck of cards at home? Tired of staring at the TV? Not a good conversationalist? Well Social Cycle has you covered with some game ideas during your tour. First, each participant needs a shot glass. Second, fill all glasses with water except one with vodka. Third, shuffle the shot glasses around. Fourth, everyone pinches their noses and takes their shot one at a time until the inevitable happens; someone gets the vodka. Finally, if the person who gets the vodka shot manages to conceal the fact that they drank the vodka, that participant gets to choose someone to take a vodka shot. If not, fill ‘em up and keep the rounds comin’! This game only requires one to know famous people – easy, right? First, the game begins with the first player saying the name of a famous person. For example, they start by saying Winston Churchill. Secondly, it’s up to the following player to say a famous person’s name that begins with the first letter of the last name just mentioned. A possibility in this situation could be Christina Aguilera followed by the next player saying a name and so on. Now if a player says a name where the first and last name starts with the same letter, the game changes direction. Finally, if a player cannot immediately name someone they must take a drink and the game restarts. So, turn off those phones and turn up the brain power! First, everyone must have a cell phone. Second, place all the phones in the middle of the table and shuffle them up. Third, everyone grabs a random phone. Fourth, without sending it, everyone composes a text message to someone on that phone. Next, the group goes around in a circle and, without seeing the message the phone’s owner can choose to take a shot or let their phone’s captor send the message. The game then continues until everyone has zero friends left on their phone (joking!) – but, there might be some explaining to do in the morning! This game is short and simple. It consists of playing at each bar on your stop and assigning different drinks par values (points). For example, a shot is par 1, a mixed drink is par 2, an IPA beer is par 3 and a pilsner beer is par 4. After your tour ends add up your scores and reward the winner with… a golf clap? We dunno, but we’re sure you’ll think of something. Oh, and don’t forget to wear your golf attire! Do you like animals? Can you make animal noises? If so, this game is for you. First, every player chooses an animal. Second, the first player acts out his/her animal by its noise, motion or both. Third, when that player is finished acting out their animal they point to the next player who then follows by replicating the noise/motion of their animal. Play should move quickly, and anyone who pauses too long has to drink. The game requires a voice, some flailing arms and a high tolerance when getting heckled from your fellow patrons. Hee-Haw!! Editor’s Note: Please drink responsibly and be respectful of the bars you attend. Oh, and remember you still need to pedal! Happy Gaming!! Did you know that temperatures in Southern California can dip down to 40 degrees? We know it’s unbearable and scary to think about, but here at Social Cycle we have you covered. We have put together a survival guide for you. Dress Appropriately: Mom always said to wear a hat in the cold because we lose 80% of our body heat through our head. So, bundle up with a jacket, hoodie, hat, beanie, earmuffs, scarf and gloves. Want to add some extra flair to your tour? Make it a themed tour and wear a warm costume or onesie. Daytime Tours: Book a daytime tour and avoid our frigid arctic Southern California nighttime temperatures. Keep Those Feet Pedaling: While on your tour you’ll be pedaling, thus generating instant body warmth from stomping on the pedals. To create further warmth waive your arms around like a wacky waving inflatable arm-flailing tubeman! During Your Tour Stops: For those chilly nights order a hot and tasty boozy beverage. Irish coffee, hot toddies and hot buttered rum are some of our favorites! During Your Tour Stops: Still cold? Well it’s time to hit the dance floor and dance, dance, dance! Warm those muscles and impress your friends while doing the running man, the sprinkler, the dougie or even a little flossing. It’s the holiday season! Time to spend hours choosing a gift for each person in your life, or not, but no worries we’ve got you covered! Avoid the crowded malls and hop on your computer to pick-up some of our gift ideas. Depending on when you purchase one of these gifts some will come with an additional discount and/or free shipping! Santa Barbara is an undiscovered treasure – it can seem like an underdog compared to the bigger California tourist destinations like San Diego or Palm Springs, but it’s a hidden gem with lots of unique sights to see. Whether you’re looking to find a day of relaxation or a night of painting the town red, Santa Barbara attractions are varied and span the board of all different kinds of fun. See a show, sip a drink, or enjoy the views – These are the best things to do in Santa Barbara! It’s time for a night on the town that is full of jams, drinks and an awesome atmosphere for some live music. The Santa Barbara Bowl is a non-profit and the leading outdoor performing arts center in California, and they get some BIG names in for shows. From Rod Stewart to Arctic Monkeys to Shaggy, they’ve got genres for everyone. Try a wine tour fit for a queen – The Urban Wine Trail has a reputation of highlighting the best wines in SB – with all the choices on the trail, even the pickiest sommelier-wannabe will be happy. What is wine without a food pairing? Disappointing. Grab a delish sammie at Metropulos Fine Foods to soak up all the wine! Reconnect with your green thumb, and see what kind of giant Jurassic Park-style plants are still around today. Lotusland is a great place to relax and stroll through amazing floral scents and gorgeous blooms. It’s a perfect way to restore and find some calm in a fast-paced world. Lotusland also holds events such as historical programs and exhibits. The perfect way to escape the rat race to enjoy a good sweat and better views. The Inspiration Point hike is well-trafficked, but for a great reason. It is a great length and ends with a great reward – amazing ocean vista. Grab your favorite workout buddy and enjoy one of Santa Barbara’s iconic hikes! It was obvious we were going to make our own list of Santa Barbara fun, right?! Join us for a roll through Santa Barbara’s best bar scene and brew scene. Social Cycle is the perfect way to see the best of Santa Barbara and have a blast doing it! Spa at the Bacara is an incredible, holistic spa-experience that will leave you feeling refreshed, rejuvenated, and ready to go! Relax in their redwood sauna and eucalyptus steam room while enjoying their incredible treatments, like their Hollywood Facial. Pretend you’re an A-list celeb and soak in the luxury! We’re lucky to have an abundance of eateries in Southern California that are vegan and gluten-free, but we especially love the Green Table. With a nutritionist as their general manager, you know you’re eating food that tastes good and is good for you! It’s a great option if you’re looking for a juice cleanse, or if you need something a little more filling. Try the Veggie Pizza! We love the story behind Brass Bear Brewing and we LOVE their beer (which is why they’re a bar partner for our Santa Barbara party bike tours). Started by a husband and wife dream team in 2016, Brass Bear serves awesome beer, wine, cider, charcuterie boards, and hot sandwiches that will have you coming back for more. Support an awesome biz that serves some awesome brews! Twenty-one is a big milestone…you’ve made it through the first two decades of your life and you’re finally allowed to (legally) drink. Southern California has SO many great bars and restaurants that serve great local beer, specialty cocktails, and feature awesome live music to get your night going right. It’s almost inevitable that you’ll end up drinking a little more than you bargained for that night, but instead of starting off the night by walking bar to bar, we’ve rounded up our four favorite 21st birthday party ideas. You’ll get to pedal around your city with up to sixteen of your favorite friends and explore some of the neighborhood’s best bars. Not only do we have great partnerships set up with our friends at these bars (a.k.a., you’ll save some cash this way), you’ll make memories you *hopefully* won’t forget. Social Cycle party bike tours are a great way to kick the night off right in a unique way that will be the envy of your already-twenty-one friends who didn’t have a cool party like this. You’re going to be consuming some alcohol that night, that’s why you’re going out! Get the celebration started with a food tour around the city and give yourself a little bit of food in your stomach for when those nice strangers at the bar start buying you shots. Chances are, you couldn’t make a classy cocktail before this day. Not because you’re not classy, but because you were limited to the cheap alcohol your friends would bring over to your house. Vodka and Country Time Lemonade? Done. But that’s all changed! You have entered into the real legal world where you can freely spend $100 on quality liquor, grab some bitters, and even learn what muddling means. Turns out there’s more to wine than red or white, who knew! Now that you can drink *all* the varietals, visit a local vineyard and learn how to tell the difference of how it smells on the nose and tastes on the palate. Unique team building tours have shaken corporate America in the last few years. From escape rooms to improv classes to party bike tours, there is a multitude of ways to bring your employees together that are fun, engaging, and out-of-the-(boring)box. Since we are Southern California’s experts on all things fun, we wanted to focus on our favorite corporate team building outing- party bikes. We’ll cover how corporate party bike tours teach employees the importance of teamwork and how you can build a team while building some muscle. Now, screaming “PEDAL!” at the top of your lungs while you cruise down the street on Social Cycle may not be your first idea of great communication and teamwork, but you’ll quickly realize that in order to make it to your next destination everyone needs to be moving those legs and engaging to successfully make it down the street. Similarly to tasks in the workplace, everything gets accomplished faster and better when you have a team of people working in unison towards the same goal. Occasionally, offices can become similar to high school cafeterias. You’ve got legal in this area, HR over here, and sales and marketing over there. And similar to vinegar and oil, they do NOT like to mix. However, bringing different departments together can create a feeling of unison within the entire company. Sitting them next to each other on a moving 16-person party bike will ensure that the individuals who wouldn’t normally interact have an opportunity to get to know each other and bond over the shared perspiration and exhilaration they experience while exploring the city. Back in the office, this connection and blossoming friendship will encourage departments to work closely together to accomplish goals and increase communication between employees. Finally, it takes strong communication and teamwork to make decisions. Which bars are you going to hit? Will you be stopping at a cupcake shop along the way to get your sugar fix? These are decisions that everyone should make together. Similarly to office life (and just life), sometimes you have to learn to compromise to get the job done. It’s actually impossible for every person to get their own way (we know this first-hand) so teaching your employees to have discussions and make group decisions will help your party bike tour go smoothly and your weekly meetings go even smoother. We’re sure you’ve seen us pedaling down the street in SoCal, and you’ve probably thought it looked like an absolute blast! We love having San Diego corporate team building groups join us, as well as all those looking for team building in Palm Springs and Santa Barbara as well! If you’d like to learn more about booking a tour and watching your employees flourish, check out the link to your city’s corporate events page below. It’s (Bachelorette) Party Time! We know that planning the perfect bachelorette weekend in beautiful Santa Barbara can be amazing but also stressful! Let us help! Grab your girls, your matching t-shirts, and meet us down in the American Riviera. Here’s our guide to the most memorable things to do, specialty drinks, food to eat, and places to stay that are sure to make yours the perfect bachelorette weekend! Kick off your bachelorette weekend with a pedal around beautiful Santa Barbara. Grab your girls, some brews, and hop on! Check out all the best bars in Santa Barbara while pedaling away – so it’s healthy right? You might even make some t-shirts so everyone around town knows that you’re the best bridal group… ever! Keep it intimate with a private bike, or just enjoy the party on a public ride. You can’t go wrong either way! Experience Santa Barbara in the best way with Social Cycle! No permission slip needed for this bus ride! Grab your hall pass and your girls and jump on the wine bus. Book a private tour and experience a rolling wine tasting of some of the best wines from Santa Barbara and Santa Ynez Valley! Jump on the School Bus wine tours specializes in making your bachelorette weekend perfect, complete with a themed school party bus to pick you up! The best part? You don’t have to pretend to know how to properly taste wine (I’m getting hints of… grapes?). This wine tour is sure to be a highlight of the weekend! Let’s take a minute and go to our happy place! The classes at Salt Cave will help you achieve complete peace. Also how many times do you get to say you meditated in a salt cave?! The perfect place to meditate, then take an adorable pic of you and your bridal party. Make a day of it and reserve the bridal party experience. You’ll experience a whole new meaning to being zen! Eucalyptus steam room. If that sounds good to you, this spa day will be absolutely perfect. Santa Barbara has no shortage of spas, but we especially love the services at the Ritz Carlton hotel. Overlooking the ocean, complete with a redwood sauna and rooftop bar, this spa is the picture of relaxation. Picture yourself relaxing with your girls while enjoying the featured chamomile lavender summer dream massage or the full body experience of chamomile lavender salt scrub. Get yourself ready for a night on the town with a day of relaxation. 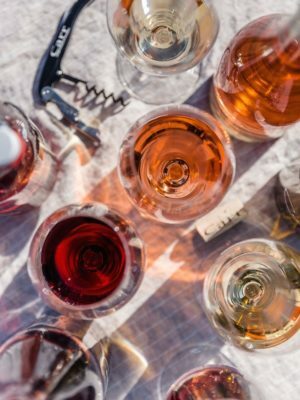 Are you ready to sip your way through the wineries of downtown Santa Barbara? You should be! A wine tour with Urban Wine Trail brings a whole new meaning to boutique wineries. Customize your tour and make it 100% tailored to your party. DNCE recommended cake by the ocean, but we prefer wine by the ocean! Wine(d) your way around downtown Santa Barbara with your wine tour on wheels! Does sipping on the sea sound as amazing to you as it does to us? Santa Barbara Sailing offers all the water fun you can imagine. Take your girls for a day cruise or get a little workout in with a stand-up paddle board excursion (not that you need it – mimosas have orange juice in them so they’re healthy). Take a private charter to the world-famous Channel Islands National Park and Marine Sanctuary, the Galapagos of the Pacific. We absolutely cannot get over the amazing pictures you can take on these beautiful boats with a breathtaking backdrop. Brunch on a yacht is nice, but brunch on a sailboat is truly spectacular. It’s time to experience the taste of Santa Barbara. If fire roasted milkshakes and baked mac ‘n’ cheese peak your interest, Finch & Fork is the place for you! They keep the food simple with 6 ingredients or less per dish, so it’s up to you and your girls to bring the adventure! This is the perfect place to keep your stomach in check before a wild night out! Everyone loves anything artisanal, right? The Lark’s unique vibe and exceptional dinner, dessert, and wine list is sure to make your night special. The dinner menu comes from three of our favorite places, “from the farm,” “from the ocean,” and “from the ranch.” Located in the heart of the Funk Zone, this is the perfect place to kick off your night! Brunch. Coffee. Pastries. If that sounds amazing to you, check out The Shop! Everything is freshly baked just for you; plus their six variations of eggs benedict has our mouths watering. The Shop is the perfect place to kick-off a relaxing spa day with your girls or to catch-up after a wild night out. Keep the party going with some mimosas or refresh with a freshly roasted coffee from Handlebar Roasters! We are always in favor of a little south-of-the-border action. You’ll find plenty of that and much more at Los Agaves. Yelp rates it as one of the top five restaurants in Santa Barbara and we actually agree! They call it contemporary Mexican dining, we call it the perfect place for margs and signature enchiladas (think: fresh halibut and shrimp, roasted veggies, topped with smoky chipotle sauce.. amazing!). So, grab your girls and take the party south of the border! Cocktails.. On the beach.. At sunset – can it get better than that?! The Boathouse at Hendry’s Beach offers that sought-after California dining experience. Incredibly fresh seafood plus one of Santa Barbara’s best happy hours is sure to be a highlight of your bachelorette weekend! Get lost in the breathtaking sights of the ocean and the endless California shoreline with the perfect drink in your hand. If you’re looking for a one-stop shop, we’ve found it for you! The Waterline is an amazing industrial warehouse turned food and drink destination. Inside is not only one, but four exceptional taprooms, wine bars, and brewing companies. Not to mention the food from The Nook is designed to pair beautifully with beer and wines offered throughout the venue. Bring the party and experience the industrial vibe at the Waterline. Ready to fall in love with Southern California beachside living? Hotel Milo offers classic SoCal beachfront with a contemporary twist. The blend of beach-chic decor with classic Spanish Colonial architecture is not only amazing to look at, but is sure to provide the perfect backdrop for an adorable party pic (do it for the Gram)! Speaking of pictures, image how picture perfect you and your girls will look cruising down the beach in your complimentary beach cruiser (rental included with your stay)! Let’s kick this party up a notch, with an entire house! Rent an AirBnb and have all the freedom you can ask for, plus the comforts of home! Stay in one night and make that authentic Italian dinner you’ve been craving. Remember, the wine is absolutely pivotal! Have space to sprawl out or use that space to bring the party home! Find that adorable beach cottage just steps from amazing bars and breathtaking views. Welcome to the Hotel California(n), such a lovely place. Okay, okay, we know this wasn’t exactly what the Eagles were talking about, but they would agree with how amazing this pick is. Redefine American Riviera with the modern Spanish colonial architecture. Steps from the beach and adjacent to the Funk Zone, the Hotel California is the perfect place for your party to begin! Did we mention the rooftop pool? Seriously, drinks, on the rooftop, overlooking the beach; paradise! Make your Bachelorette weekend truly exceptional at the luxurious Kimpton Canary. Complete with four-post beds to make you feel like the queen you are, and all-day rosé to indulge in, this place is so much more than a regular hotel. You already know we’re big fans of rooftop bars, and the Kimpton doesn’t disappoint with its rooftop pool and bar. Local wines are always making their rounds; plus, if you’re there on a Saturday morning, be sure to check out one of the rooftop yoga classes! Did someone say bungalow? Treat yourself and your girls to the life of luxury at the Four Seasons. Get a private bungalow and bask in the secluded, relaxing nature of this luxurious stay. Don’t forget about the 22 acres of beachfront property ready for you to explore, or just look at (we aren’t judging)! Plus, the rain shower in every bathroom is sure to make the getting ready process utterly amazing. Whether you’re a California local or your party is flying in for your SoCal bachelorette adventure, our Santa Barbara Bachelorette Guide will give you have an unforgettable vacation so you go home with memories to last a lifetime!